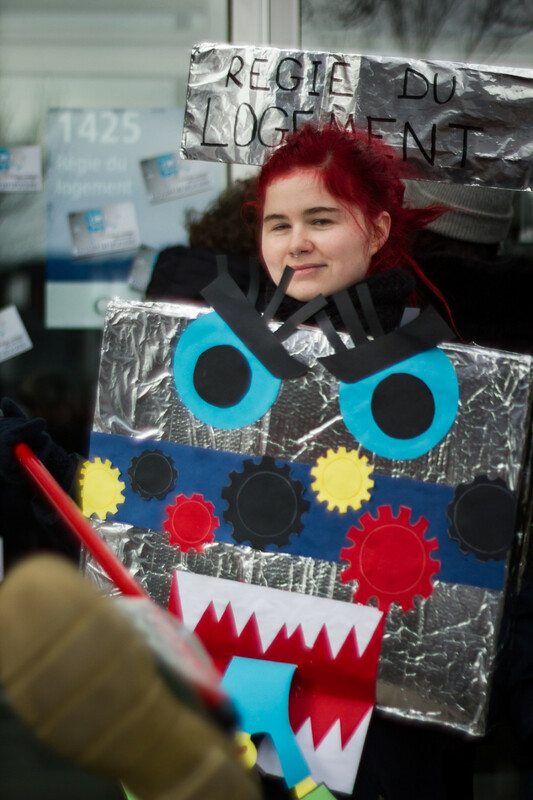 While speeches were made, a protester dressed as an “eviction machine,” eating a tenant as they swang a boot while pretending to be the Régie. After speeches finished, they threw the costume around. Soon it was smashed and run over by a wheelchair. The carcass was left at the Régie’s door. 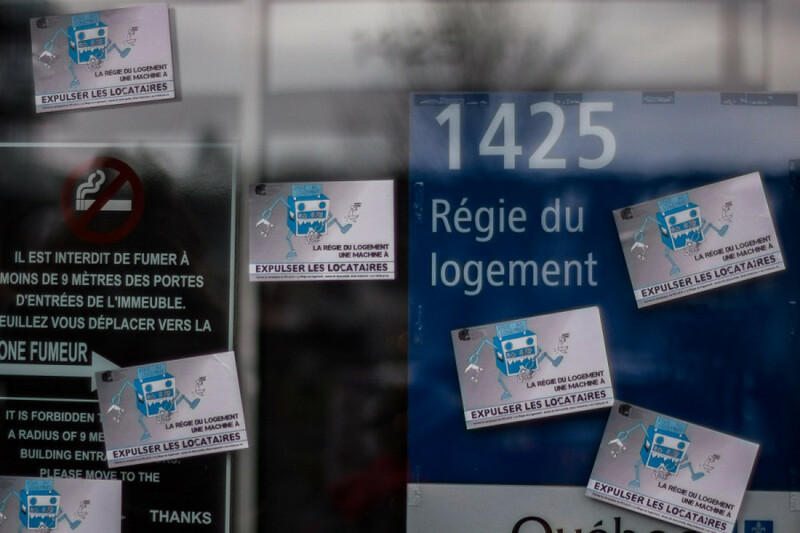 The Regroupement comités logements et associations locataires du Québec is demanding that the state of housing in Montreal improve. Currently health problems and financial instability can’t be used as grounds of defense for those who fail to pay their rent, and the group wants to see that changed. They demand that leases can only be terminated if landlords can prove a tenant has committed a serious offence, and that every case at the Régie be dealt with on a first come first serve basis. Right now, cases led by landlords get heard before those led by tenants. Demands were read out by spokesperson of the group Marjolaine Deneault. 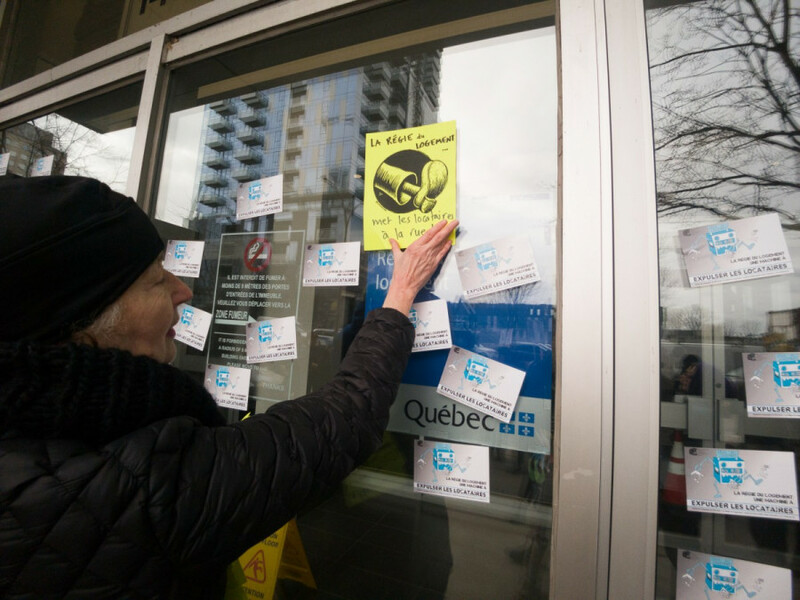 Led by RCLALQ, the crowd marched from Place Norman-Bethune to the Régie’s office and put up stickers and posters all over the front doors and windows of the office. Protester and former president of the Comité d’action de Parc-Extension, Cecile Ngo Hull, said that she’s tried to get her problems resolved with the Régie three or four times but nothing ever came out of it. Once, a landlord cut out her electricity because she had spoke out about problems in the building. The Régie decided that because it was unclear why the power went out they would reimburse her for damages, but they never took any action against her landlord. Lawyer Manuel Johnson often represents tenants at the Régie, and says that the rigid application of the law by the Régie creates stress for many Montrealers. Johnson said the laws in place tend to give the upper hand to landlords. Rent non-payment cases can be heard within four to six weeks. On the other hand, tenants who want to take their landlord to the rental board because they have mold, bed bugs, or heating problems can wait up to two years before getting their case heard. According to Abraham, 90 per cent of the cases that are heard at the rental board are submitted by landlords. That’s because many of the problems the rental board sees are about rental non-payments. “It’s not a tribunal that allows equal access for all parties and that’s really problematic,” she said. The average price for a one-bedroom apartment in Montreal is $700 per month, while welfare is $625. Half of tenant households live under the poverty line and there are over 100,000 households that spend half of their income into their rent, said Abraham. Spokesperson for the Régie David Morin refused to comment. 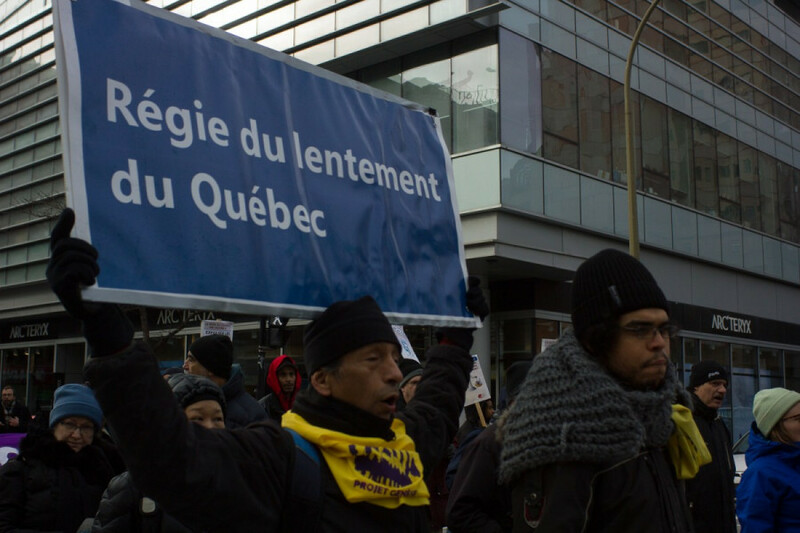 Other groups protesting included Concordia’s Housing and Job Resource Centre, Logi Action, and the Comité d’action de Parc-Extension. According to a HOJO assistant, Hannah Brais, a lot of the people who are affected by this are students and immigrants who are unsure of how to navigate the Régie and are left vulnerable.